Debbie and Tom use these dollars to help support the animals in many different ways: from buying the monkeys and apes their favorite foods to making their homes bigger and better. Debbie and Tom Misotti rely on donations to help provide the 14 monkeys and apes that live here with the food and support they need. One thing that we can always use is helping hands. 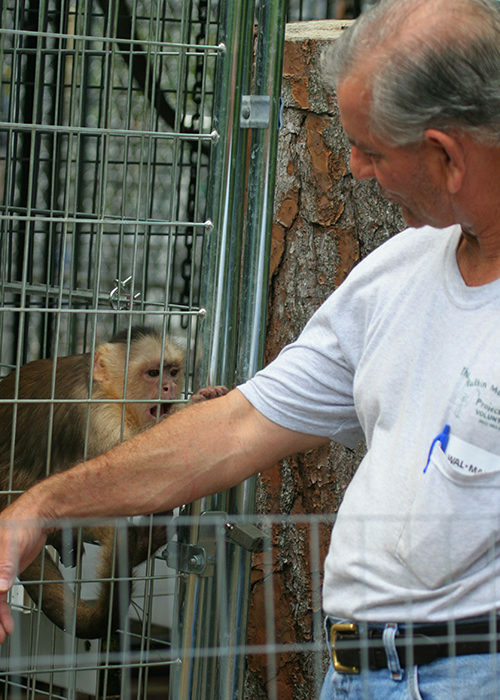 Volunteers play an important role and are vital to The Talkin’ Monkeys Project mission. We would love to build a bigger volunteer corps. While working as a volunteer onsite may not be for everyone, there are plenty of ways to get involved here, and I bet we can find a job that’s just perfect for your skills. We use these barrels – which should be clean and never have contained any chemicals (olive or pickle barrels are just fine) as shelters in our outdoor cages. We like to hang them or place them so our friends have an alternative shelter to get out of the weather or to take an afternoon snooze. Corn crib cages, usually used to keep corn, are just great additions to our habitats. We can use them to provide “turrets” for our primate homes. These are also known as silo cages and are manufactured by Behlen Industries in several sizes. The capuchins just love these kinds of things to play on. 24 and 32 ounce sizes, plus cage hangers are ideals. We get thirsty out here! The capuchins just love to play with these! 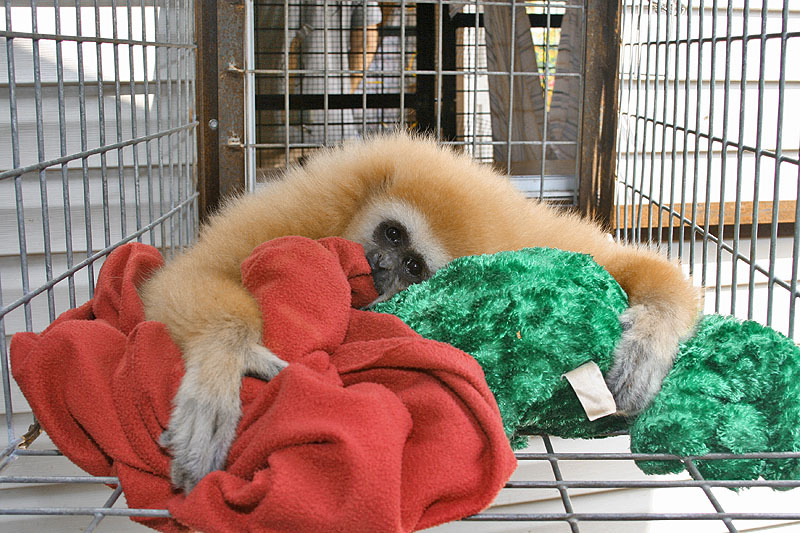 Tyco/Little Tykes playhouses are just great for the gibbons to and larger monkeys, who love to play in and around them. We’ve been able to adapt these structures to incorporate them into cost-effective and sturdy monkey and ape homes. We need steel horse panels with 2-inch-by 4-inch openings and 12-foot or 16-foot long panels. These sturdy hoses – often discarded by fire departments when they may not be useful for fighting fires but are still great for hanging on – provide hours of enrichment possibilities. 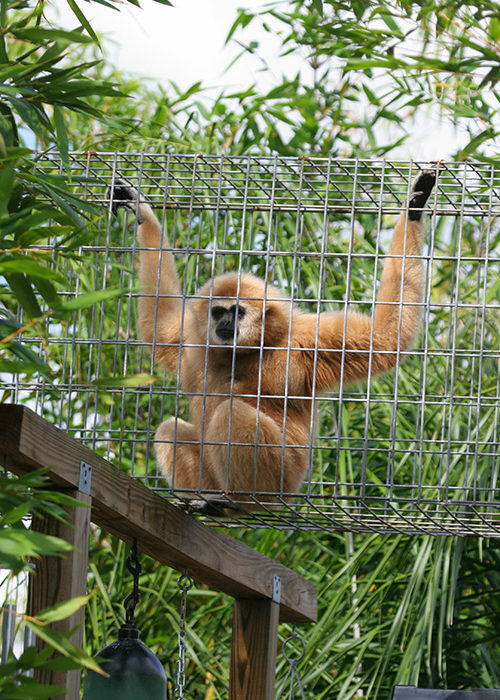 We need 4-by-4 by-16 posts to use as supports for the chutes that the monkeys use to travel from place to place. The same goes for the Tek decking. We use these as hanging shelves. Dog Kennel Panels to expand habitats. These cardboard envelopes provide enrichment for Talkin’ Monkeys residents. In the wild, these animals have to “work” for a living. By “hiding” their food in things like these envelopes and other “complex” devices, we provide them with activities to occupy their minds, as well as filling their tummies. Talkin’ Monkeys is a proud member and supporter of the American Bamboo Society and South Florida Caribbean Bamboo Society and we find that bamboo offers a hurricane and drought-resistant shade and security for our monkeys and apes – plus they find it just plain tasty! All the bamboo species we plant are non-invasive, clumping varieties – an important consideration in a state that’s trying to eradicate many invasive species that do more harm than good. We use this to line the pathways around the Talkin’ Monkeys Project. We use these barrels to help us burn debris. These should also be new or never have contained any chemicals whatsoever. Of course, you might think we get plenty of fertilizer for our bamboo with 11 monkeys, three horses and a few dogs. But we can always use more commercial fertilizer– so help us lay it on thick! Mosquitoes are always a concern out here in the middle of Florida. Mosquitoes bite the monkeys and apes, too! Both bats and purple martins are famous for feeding on mosquitoes so the more we can do to attract them to our space, the better! We’re always looking for ways to keep our animals pest free – and that certainly goes for mosquito removal. Donations of Mosquito Vac, Skeeter Vac and the Mosquito Magnet are always welcome. Please contact us for a few primate faves. Bleach – we use 10 to 12 bottles a week! All-Terrain Vehicle – This would help us with fogging and spraying, seeding, mowing and any and all manner of things. Things to Help us Communicate with You!